On July 17, 2018, Vice President Wang Qishan met at Zhongnanhai with Director-General of the World Health Organization (WHO) Tedros Adhanom Ghebreyesus. Wang Qishan said that China has enjoyed sound cooperation with the WHO. President Xi Jinping visited WHO headquarters last year, stressing that people's health should be placed in a strategic position of priority development. The Chinese government is committed to advancing the building of a Healthy China and constantly improving the level of people's health and sense of happiness in the course of development. The Chinese side appreciates the WHO's important role in coordinating global health development and supports the WHO in promoting the implementation of the health-related Sustainable Development Goals at all levels. The Chinese side is willing to further strengthen cooperation with the WHO and contribute to promoting the development of the global health endeavors. 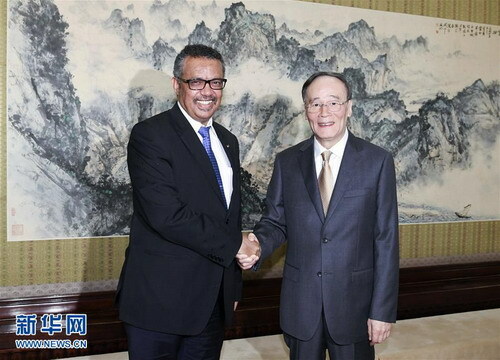 Speaking highly of the achievements in the health endeavors with Chinese characteristics, Tedros Adhanom Ghebreyesus expressed that the WHO will continue to firmly uphold the one-China principle and deepen the strategic cooperation between the two sides within such frameworks as the Belt and Road Initiative and South-South cooperation.